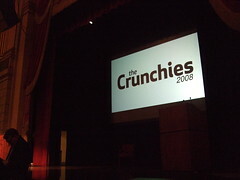 Image by magerleagues via FlickrThe second annual Crunchies took place last week with Facebook securing the top prize for Best Overall Startup for the second year running. The majority of sites that I frequent were acknowledged through the catagories. Friendfeed secured the Best New Startup and the Friendfeed developers were runner-up in the Best Startup Founder behind Twitter. I felt that they should have been acknowledged in the Best Design catagory mainly because Facebook were impressed and borrowed heavily from the Friendfeed setup with their redesign. Let me know what you think, would you be interested in this feature?